I know most of us watch TV and wonder if that stuff even works especially when they have it on a talk show. This was shown on The Ricki Lake Show and Marie (With Marie Osmond). Well, this product that I got to review not only answered that question but also solved a problem for me: whitening my teeth. It’s crazy expensive to go to a dentist and have your teeth whitened. There are more and more at home products out there, and I got to try one. 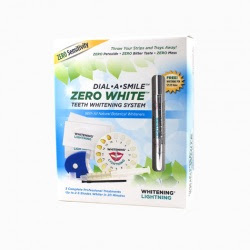 Dial A Smile: Zero White Teeth Whitening System is A zero sensitivity at home whitening kit. It is so easy to use. You don’t need any strips or trays. All you do is apply a little gel to the brush and apply it to your teeth. There is a cool little LED light that you put in your mouth for a few mins and you’re good. On the box it says to use it for 14 days for the best results. My teeth aren’t super yellow but I still used it all 14 days. It says that it your teeth will be 2-7 shades lighter. I would show you my teeth but I couldn’t get a good picture :/. There was also a pen inside the kit for maintenance. You don’t need the LED light for the pen. Overall, I really liked this product and if you need a little brighter smile (and who doesn’t) this is really for you. Visit their site today to order yours.